This post is brought to you by IdeaSolutions, creator of AirBrowser. Would you like to surf the web, watch streaming videos, read newspapers and do everything else you normally do on your Mac browser, in full screen on your TV? Pinch to zoom, swipe, bookmark pages — all using your iOS device as a remote control? AirBrowser let’s you do all these things. You can get the full desktop browsing experience on your television, with all the sites you visit optimally scaled to fit your TV’s screen size. Read on and watch the AirBrowser video for more info on this easy-to-use app. AirBrowser is a specialized app that lets you browse the Internet in desktop mode on Apple TV. It’s very different from Apple’s standard screen mirroring. 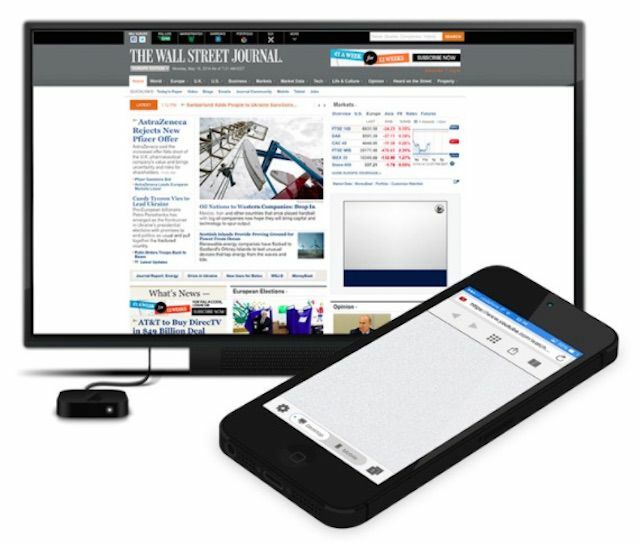 With this new solution, your mobile device acts as trackpad and keyboard while web content is automatically shown in desktop mode, rather than the usual stripped-down mobile format, on your connected TV. It’s like you control a real mouse pointer on your giant TV screen. The app has been optimized to offer an unpaired TV browsing experience: You can use gestures that you normally use on iOS to scroll pages, zoom, manage tabs, etc. Since the contents are shown in desktop mode, a lot of work has been done to circumvent Flash limitations that would normally cause you problems. For example, YouTube videos are automatically replaced with an HTML 5 version that can play on iOS devices. During video playback on your TV’s gloriously large screen, you can use your iPhone, iPad or iPod touch as a remote. All you need is an Apple TV (or a supported HDMI cable) and an iOS device. AirBrowser is available in the App Store, priced $4.99. There is also a free version you can try before buy.